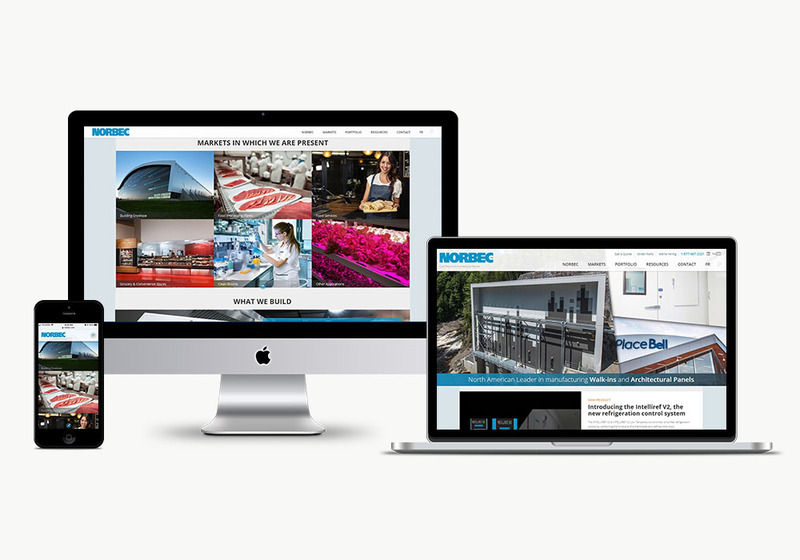 Norbec is proud to launch its newly redesigned website. The need for a common destination for both the architectural panels as well as the walk-ins became more and more of necessity seeing as in some markets the need for the combination of both products was increasing. The objective was to give the ultimate user-friendly experience through an improved navigation and functionality. Tabs were rethought to allow the user to obtain the information needed quickly, through precise user experience analysis and strategic planning. Each project requires different products, specifications as well as options, so Norbec decided to regroup its main activities under six different markets, enabling the user to find all the information relative to a project under one tab. In return, this mapping process will help new and actual clients get the right information quickly without losing themselves in the different types of products and information offered at Norbec. All projects completed over the years have become a source of pride at Norbec, therefore a project gallery tab was created to put forward all these accomplishments. The project pages will not only have multiple photographs of the project, but also all of its details such as products used, companies involved and information relative to the design of the product and the challenges or special needs addressed along the way. The whole site was designed with the users’ experience in mind, ranging from new clients, actual clients and Norbec’s employees. This website is to be a point of reference for any type of information needed, no matter its complexity. The different tabs allow the user to easily access information through its organized paths. The resources tab was the most complicated one to address as it needed to harbor the most information and files while still being user friendly. The integration of two independent filters was added to search among markets or specific products and applications. With continuously updated documentation, this website is a content-rich, user friendly platform for all parties. A career page was also developed to keep users updated on the available positions at Norbec whether in the office or the factories. Don’t hesitate to apply or share with your peers the different opportunities available. Don’t hesitate to navigate the website and discover all its features and functionalities. Furthermore, don’t forget to follow Norbec on Linkedin and Facebook. If you have any questions or feedback, please contact us at marketing@norbec.com.